For suppliers to stay competitive in today’s marketplace, it is imperative to design and implement a strong retail execution strategy. Utilizing retail audits is the best way for a merchandiser to capture critical field data that affects the health of their company and its products. By analyzing longitudinal data, business owners and managers can prove what works and what doesn’t to make more informed decisions and adjustments to their retail plan. In this post, we will discuss everything you need to know about conducting a retail audit, as well as how to use the data gathered to make more informed business decisions in the future. The benefits of conducting retail audits are twofold. On the one hand, they serve as a tool for suppliers to ensure that retailers are complying with pre-established agreements on product placement, pricing, and promotion. On the other hand, they allow brands to accurately measure their success in the retail environment. Equally advantageous is the priceless commodity of data that audits provide, though your data is only as good as your method of collecting it. By taking the steps to aggregate quality data from various retail locations over time and comparing results, managers can make actionable decisions that reduce inefficiencies and ultimately drive sales. With so much variance in the information that can be recorded in a retail audit, it makes sense to segment audits by data type. Different audit forms should be used to reflect the respective data being collected at a given store visit. Examples of the types of retail audits that a supplier might employ are listed below. Consumer sentiment towards the brand and its competitors as discovered by surveying passerby and observing how they interact with the brand. Store appearance and location. Is the store well-organized and clean? Is it located in a suburban or urban area? How does the facade of the store appear? Qualitative and quantitative information about other brands present in the store. How many facings do competing brands have on the shelf? Are there mostly emerging or established brands in your category? This information can be compiled into a finished product that resembles the merchandising report below. General effectiveness of the promotion. Are consumers engaging with your brand? Are retailers complying with the placement of promotional materials? Reps can use this data to create a promotional report similar to the one below. How many facings competitors have on the shelf. Is your brand being significantly overshadowed? Where competitors’ products are located in the store. Do they have prime placement at eye-level or near a checkout counter? Are they located in a high- or low-traffic area? Select the exact questions you will be asking in the audit and the acceptable answer types. Will you use “yes/no” questions, have reps write-in responses, or use a scale such as 1-5? Avoid frivolous questions; only ask for information that can help your business improve (i.e. brand performance, competitor activity, retailer compliance, etc.) See below for an example of the level of detail to include in your survey questions. Make sure reps collect data that directly corresponds to the goals and criteria you’ve laid out. It might make sense to have some retail survey questions be marked as “mandatory” if they’re extremely significant to company objectives. 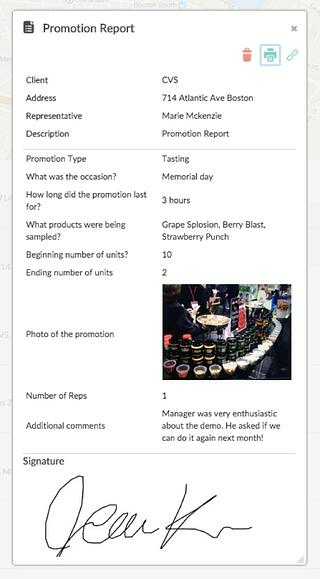 Including photos in audits is a great way to depict exactly what’s happening in a store at any given time, and promotes accountability and compliance. Review the mediums reps are using to collect data and consider how to optimize them, ideally using software (more on this below). In order to guarantee your retail auditing process is effective, make sure you and your team are equipped to understand the data you'll be collecting. There are three types of retail execution data to focus on: observational, activity, and sales data. Observational Data paints a picture of the in-store conditions your reps are observing and reporting on. This data includes stock levels, number of facings, competitive activity, and more. Activity Data refers to the specific actions your team is taking in the field to improve execution in the store. Measuring and tracking these actions is key to understanding what is impacting your sales and how. Sales Data is simply how much of each product is sold over a certain period at certain store locations -- something you are likely already tracking. But it takes on new meaning when associated with your team’s Observational and Activity Data -- giving you a sense of which activities and store conditions lead to the highest sales. 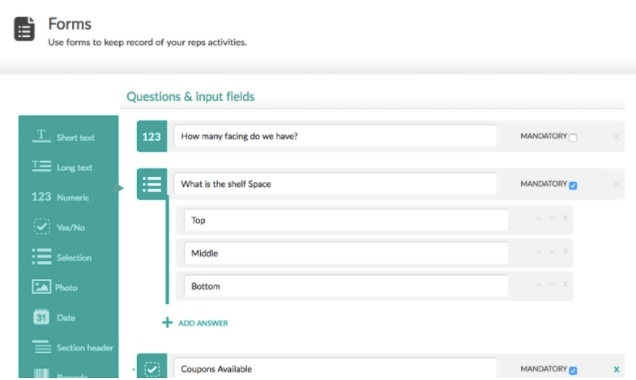 Ability to easily collect data through digital forms. You’ll want to be able to customize your survey questions to accommodate specific product families or retailers. Moreover, you’ll want customization of the allowed answer types. Ideally, some questions could be marked as “mandatory” so that brand reps cannot submit the audit without filling in a response for those questions. Synchronization of data to brand managers in real-time. The primary reason for using a technological solution as opposed to paper is so that managers can receive data from the audits immediately. The faster data is available for analysis, the faster changes can be implemented. To automate your process further, opt for a solution that readily transforms data into graphs and charts for easy visualization. Photos illustrate what words alone cannot express. They’re especially useful for revealing details about competitor packaging, shelf appearance, store tidiness, and promotional displays. Pictures are also great for depicting “before” and “after” scenarios. 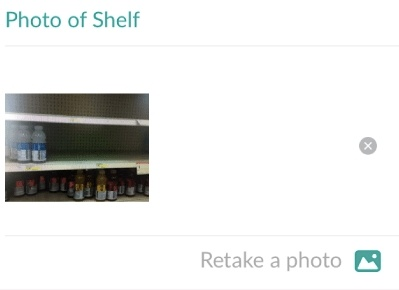 Below is an example of a photo of a shelf before it was merchandisd used inside a retail audit. To save time during auditing, brand reps can scan the UPC of a particular product using a smartphone camera, which in doing so will populate their screen with more detailed information about the product. 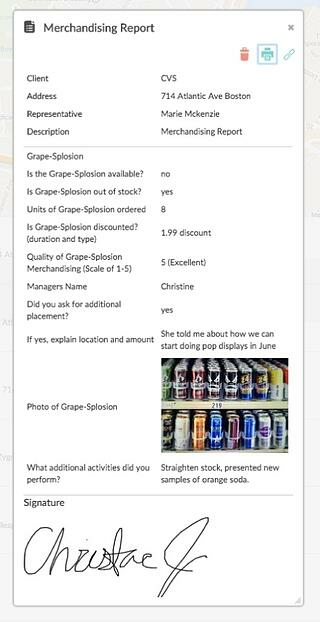 Reps can then answer product-specific questions or leave notes about that SKU. For organizational purposes, it’s helpful to know the precise location and time that an audit took place. You might discover patterns that develop over a specific time period or at certain retailers (i.e. sales boost during summer months, or slow product movement at retailers in one county). Getting a signature from a store manager lets your company know that the audit has been done. Conversely, retailers cannot argue with the findings of an audit if they sign off on it. A retail audit can help you evaluate the effectiveness of your overall retail execution strategy. However, the insights gained from retail audits are only as strong as the quality of the audits themselves. Moving forward, contemplate how your business can augment its retail audit process by streamlining scheduling, data collection, and analysis. Invest the time necessary in evaluating your findings to make the auditing process worthwhile and enable your company to make agile, informed decisions.